Effective sales coaching is something many organisations strive for – very few pull it off! We are interested to hear your nominations about who helped you in your sales career the most. Tell us what your sales coach did for you? Why should you believe they should be nominated as the best sales coach? Please nominate your mentor / coach by September 30th latest on the selling interactions Facebook page. Specify the name of your mentor and why they should be nominated. The most compelling posting (according to us!) 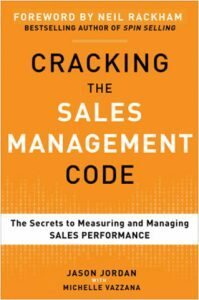 will receive two copies of “Cracking the Sales Management Code” by Jason Jordan as a prize. One copy for you and one for your coach to help your continued self development. Selling Interactions uses this book as part of our core consulting processes for designing metrics and measures for sales-forces. It is an excellent reference book for breaking down the essential processes and measures behind truly strategic sales organisations, plus it’s easy to read and use too! Please visit Facebook / competition to find out more.